At 13,804 feet, Gannett Peak towers over the Grand Teton by a whopping 84 feet. Gannett Peak is the most remote of the high-points in the lower 48, and second, only to to Denali in the 50 state high-points. It has five rugged glaciers on its flank, the largest glaciers in the American Rocky Mountains. This remote glacier-covered peak offers an exciting alpine mountaineering challenge due to its inaccessibility and moderate difficulty. 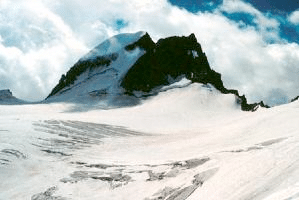 Ropes, ice axes, and crampons are usually required for this trip. This is not an easy summit, and both new and experienced mountaineers should be prepared to train and condition prior to embarking on the climb. When we took the trip in 2016, 4 of the 5 climbers successfully summited, but there is no guarantee of success. Gannett Peak is an excellent mountain for your first summit attempt! We're still finalizing the details for the 2018 Gannett Peak Climb. Click the link below to get on the list and receive more information.